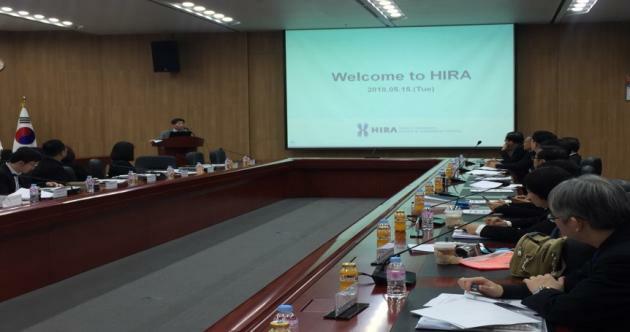 Health Insurance Review and Assessment Service (HIRA) completed a training program for Thailand health authorities and related officials on Tuesday at its headquarters in Wonju, Gangwon Province. The training program was opened at the request of Thailand’s Ministry of Public Health and was attended by 19 officials from the ministry and Thailand's Institute of Medical Research and Technology Assessment, HIRA said. Officials from the Health Insurance Review and Assessment Service and Thailand’s Ministry of Public Health attend the educational session held in Wonju, Gangwon Province, Tuesday. The program, which focused on healthcare expenditure management, was comprised of lectures and debates on reimbursement standards, medical resource management, and Big Data utilization. HIRA conducted a training course for high-level officials of Vietnam’s Ministry of Health in March. The state agency said it expects improved cooperation with Thailand and other ASEAN countries. “The know-how and efficient healthcare expenditure management operations of HIRA, which has worked to progress Korean health insurance, is expected to help Thailand and other ASEAN countries to achieve universal healthcare,” said a HIRA official.